In a football world domineered by strikers, goalkeepers are customarily the unsung heroes of their teams. Their wages and accolades are a testament to the aforementioned statement. It is quite unsurprising that presently, there is uniquely one goalkeeper who earns a weekly salary of more than £200,000 and it has been 55 long years since Lev Yashin, the legendary Russian goalkeeper, clinched the Ballon d’Or, is the only goalkeeper to do so as yet. There are ton of excellent goalkeepers in the game today. the majority of them are actually in their mid 20’s, which meant we should continue to see elite goalkeeping for a long time. let’s get into the list of top 5 keepers in 2019. However, with several goalkeepers taking the stage lately with their awe-inspiring performances, it seems only a matter of time before the unpopular taboo would be eventually broken. On that note, let us take a look at the 5 best shot-stoppers in the world right now. Manuel Neuer could indisputably top this list but his recent injury-stricken season is what stops us from putting him up there. The German goalkeeper only appeared in a handful of matches this season as he suffered a broken foot in mid-September which ruled him out for the remainder of the season. The 32-year-old has invariably been an exciting prospect for football pundits, dozens of whom have tipped him as the greatest goalkeeper of this generation. Neuer has been acclaimed for his excellent reflexes, shot-stopping ability, and footwork. His renowned role of the “sweeper-keeper’ has also garnered plaudits. He was a part of the 2014 German World Cup winning team and the prize-winner of the Golden Glove in the same competition. Alisson Becker has been a revelation at AS Roma. Purchased from SC Internacional for a measly sum of €8m, Alisson has been a revelation at AS Roma. The Brazilian goalkeeper served as a backup for Wojciech Szczęsny in his first season at the club, managing only 15 appearances across all competitions. 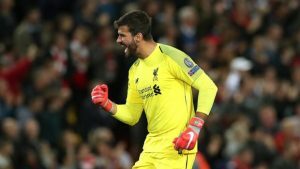 However, in the wake of Szczęsny’s departure, Alisson became Roma’s first choice keeper this season and earned recognition for his stellar performances. He was one of the key reasons of Roma’s unanticipated UEFA Champions League campaign in which they humbled FC Barcelona to reach the semi-finals. The 25-year-old has kept 22 clean sheets in 49 appearances this campaign, with a passing accuracy of 80%. The Brazilian prodigy has also been selected for World Cup 2018 as the first choice keeper. He is currently being pursued by Liverpool, who are looking for a solid goalie this summer. Atletico Madrid had to fork out €16 million for Jan Oblak in 2014, making him the then most expensive goalkeeper in La Liga history. The Slovenian goalkeeper had the onus to fill the void left by Thibaut Courtois, who departed Los Colchoneros for Chelsea. In the last three seasons, he has been an important part of Diego Simeone’s plans and has made his transfer look like a shrewd bargain with his splendid performances. Oblak’s contribution to the squad had been brushed aside prior to the recent season, where it came to the fore due to Atletico Madrid’s crumbling defence. This season, Oblak has kept 29 clean sheets in 49 appearances across all competitions and has only conceded a total of 28 goals, which speaks volumes about his goal-keeping ability. He also inspired Atletico Madrid to their 3rd Europa League title and helped them stabilize their 2nd position in La Liga, 3 points ahead of Real Madrid. 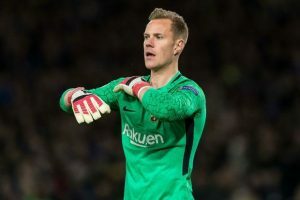 The 25-year-old is one of the most sought-after goalkeepers in the current transfer window with the likes of Real Madrid, Liverpool and Arsenal eyeing the Slovenian. FC Barcelona ran riot domestically this season, clinching La Liga and Copa Del Rey in grand fashion. Although it was Lionel Messi who remained in the limelight for these triumphs, ter Stegen was the one who oiled the wheels of the campaign. The 26-year-old is also expected to start for Germany in the forthcoming World Cup as Manuel Neuer’s injury is still up in the air. Manning the posts for The Red Devils this season was a sturdy and athletic keeper named David de Gea. The Spanish international was the bright spot in the anemic Manchester squad, which finished 2nd in Premier League, 19 points adrift of their arch-rivals, Manchester City. Although the difference seems feeble, it would have been much more prominent if it had not been for David de Gea. The 27-year-old kept 18 clean sheets in 37 appearances in Premier League with an average of 3.58 saves per goal and a claim success of 86%, securing this season’s Premier League Golden Glove. The Spanish goalkeeper is now looking forward to World Cup 2018 where he is the first-choice keeper for Spanish national team. 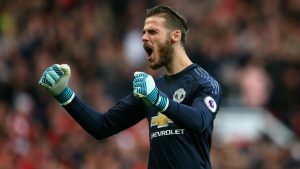 A potential candidate for the Golden Glove award, de Gea has already played 27 times and kept 14 clean sheets internationally.